Forest Blend Mushrooms contains Shiitake, Porcini, Oyster, Bolete, and Wood Ear mushrooms, producing an earthy, yet savory flavor. This particular blend adds flavorful distinction to pork, chicken, seafood, and Oriental recipes. Northwoods Blend Mushrooms contains Shiitake, Porcini, Oyster, Bolete, and Wood Ear mushrooms, producing an earthy, yet savory flavor. Shredded Wood Ear Mushrooms are believed to be good for the heart. Also called Tree Ear Mushrooms, their name comes from the fact that they are thought to look like ears growing off of trees. They have a slightly crunchy texture and a mild, earthy flavor. They are very popular in Oriental soups as well as pork recipes. Add them to stir fries, casseroles, vegetables, rice, kasha noodles, beef, or even seafood. Sliced Dried Porcini Mushrooms have a hearty flavor that makes them great for use in Italian sauces, pizza, pasta, and bruschetta. These mushrooms are most often dried and imported, as they are hard to grow in the United States. 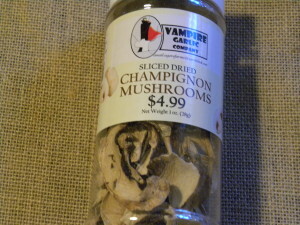 They look, feel, and taste just like fresh mushrooms when rehydrated.